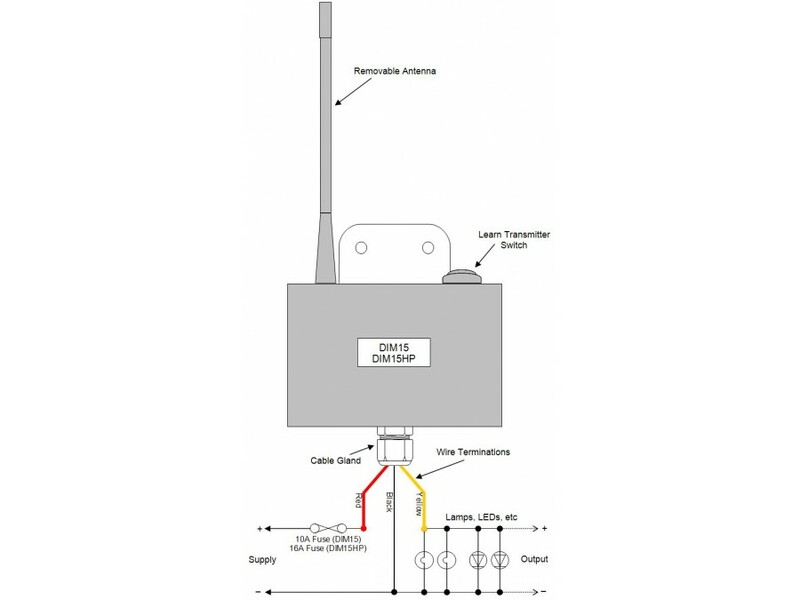 PWM Lamp/LED dimmer module, 12V/24V, 10A. IP68 Rated. Controlled by Radio - One 433MHz Transmiter Supplied. (Please contact us first if different frequency required). 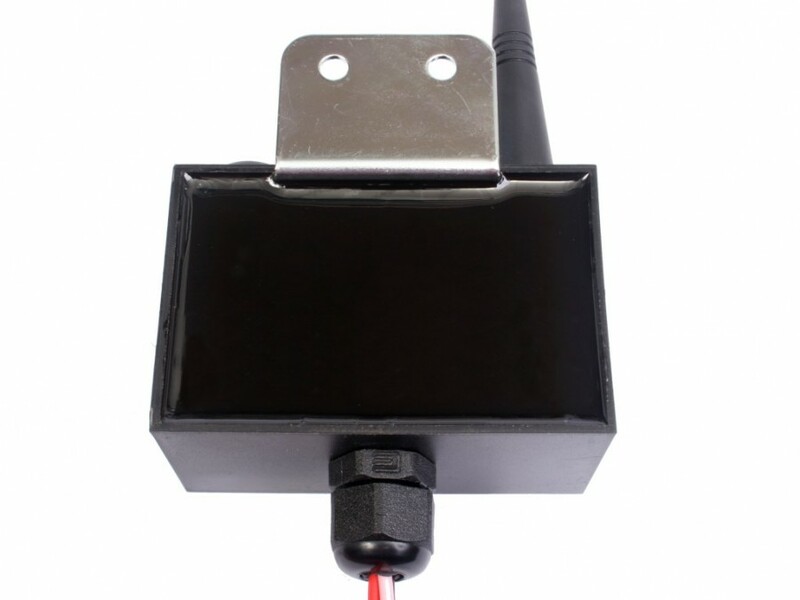 IP68 rated (fully waterproof), wire ended. The DIM15 is a fully self-contained radio controlled dimmer module designed to remotely control the brightness of low-voltage 12V or 24V incandescent (filament), halogen or LED lamps rated up to 10A. 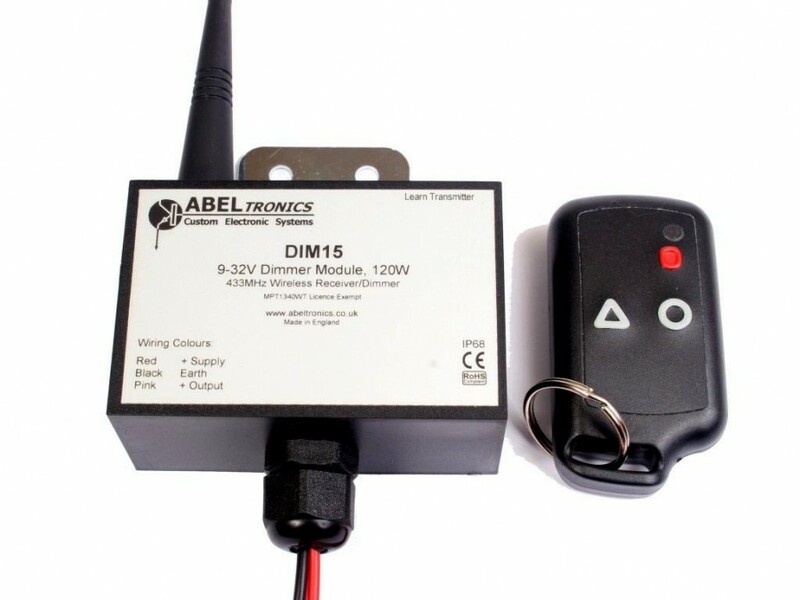 The unit is remote controlled with one or more keyfob-style radio transmitters, allowing the lamp brightness to be increased or decreased from up to 150m away. No direct line of sight is needed unlike infra-red. 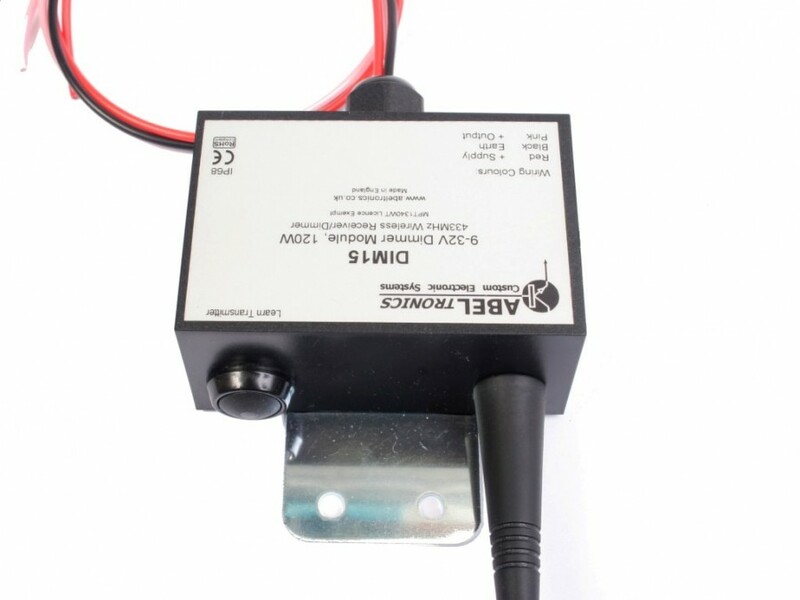 Operating from 9 to 32V DC, the module can be used in a wide variety of applications where DC low-voltage remote brightness control is desired, such as 12V or 24V automotive or marine dash-panels, low voltage architectural lighting, pond lighting, hazardous area lighting, etc. 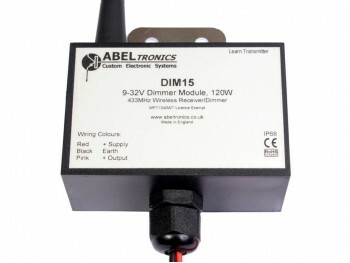 The unit employs a very efficient PWM (pulse-width modulation) switching technique to provide excellent operation for loads up to 10A, and is fully protected against intermittent output short-circuits, input over-voltage and under-voltage conditions. The module will remotely control lamp brightness from 0% (fully off) to 100% (fully on) and can turn the lamp on and off. 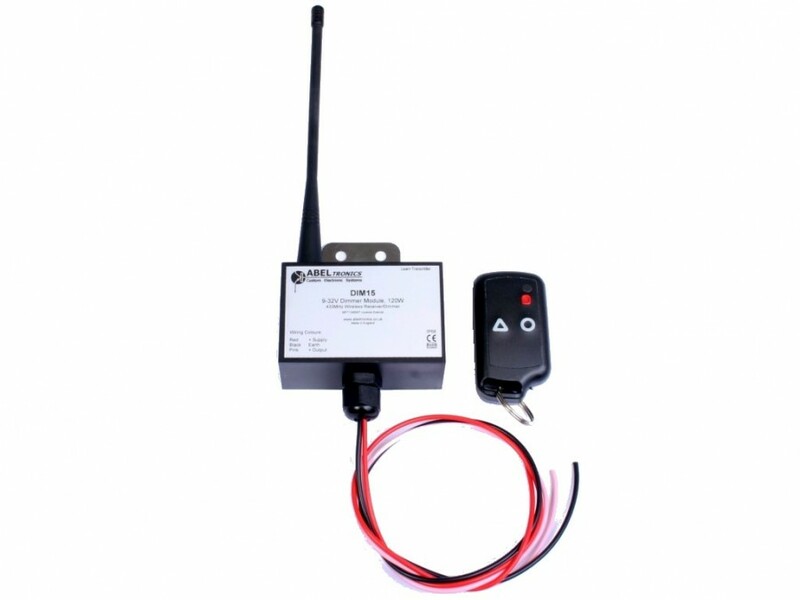 The unit also features a removable antenna and ability to be controlled by up to 50 unique radio transmitters. 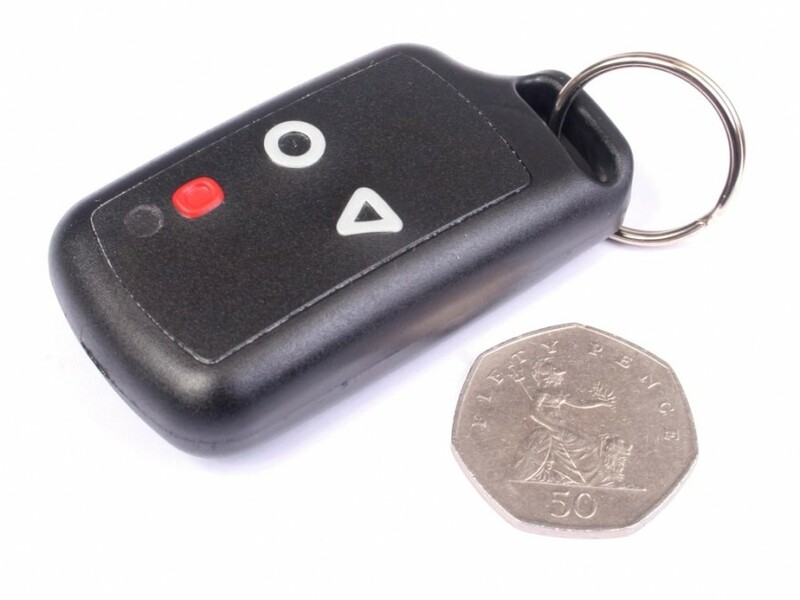 The module is controlled by the supplied keyfob radio transmitter. 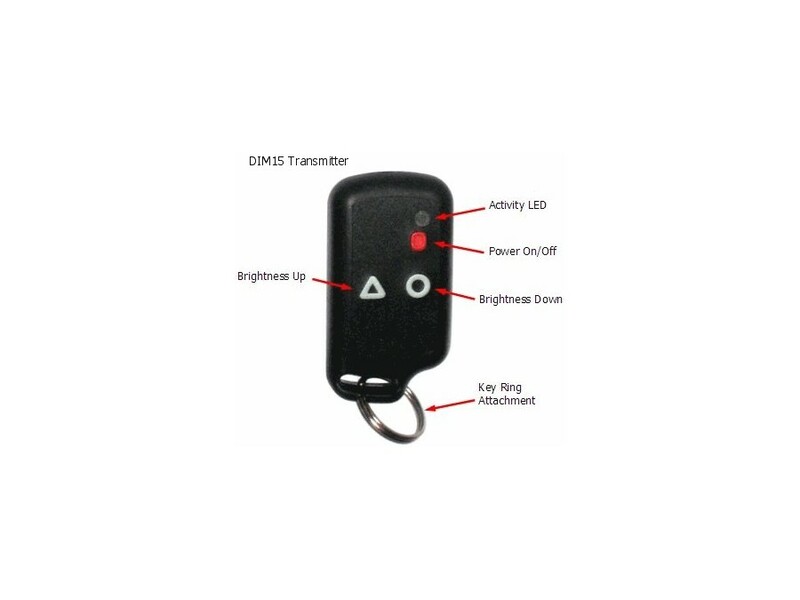 The lamp can be turned on and off or dimmed using the three buttons on the keyfob. The transmitter has three buttons, plus an activity LED which flashes whenever any of the three buttons is pressed. The triangular button increases the lamp brightness, the circular button decreases the lamp brightness, and the red button turns the lamp on and off (toggle action – press once for 'on', press again for 'off'). The lamp brightness will ramp up or down for as long as the triangular or circular buttons are pressed. Ramp time from fully off to fully on is approximately 10 seconds.